Guy Newcombe will be speaking on “Powerdrop: enabling specialty coatings without contact” at the Specialty Papers conference in Berlin on 10 April 2019. Archipelago will be exhibiting at the Joining of Composites conference to be held at the Titanic Belfast on 21 March 2019. Archipelago Technology will be exhibiting at InPrint Milan from 20 to 22 November 2018. Archipelago Technology is sponsoring the Textile 4.0 conference that will be held in Amsterdam 6-7 November 2018. Guy Newcombe will be speaking on “Adding Functionality to Textiles” at the European Digital Textile Conference on 10 January 2018 in the Frankfurt Messe. Ben Brebner will be presenting “Hot Stuff: How Powerdrop’s heated print drum is enabling high volume manufacturing” at 1.30pm on Wednesday 15 November at InPrint 2017 in the Messe Munich. 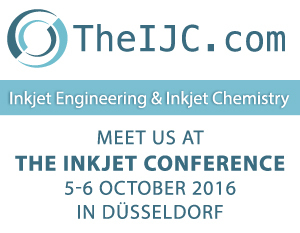 Dan Mace will be presenting “Widening the window: Powerdrop’s approach to opening up inkjet” at the inkjet conference in Düsseldorf on 25 October 2017. Charlie Stokes of Archipelago will be presenting “Powerdrop: Enabling inkjet to Excel” at the IMI Digital Print Europe conference in Barcelona between 20-21 September 2017. Guy Newcombe of Archipelago will be presenting “Powerdrop: a different way of jetting difficult materials” at the Thin Film Technology Forum in Karlsruhe on Friday 2 June 2017. The company will be exhibiting at the InPrint 2016 Industrial Print Show. The show will be held in Milan, 15-17 November. Details of the event are available from InPrint’s website (www.inprintshow.com). Our CEO, Guy Newcombe, will be presenting on the first afternoon. The title of his presentation is ‘Make your inkjet system work harder for you — three easy wins’. Inkjet is moving into large-scale, industrial, applications. This is leading to greater demands on the appearance, function, and performance of the printed surface – which requires the use of engineered materials such as glazes, high-performance adhesives, and tough paints. To meet this demand we have developed Powerdrop. Powerdrop is designed to eject a wide range of high performance materials, including ceramic glaze, hot melt adhesive and industrial paints. The Powerdrop print engine is highly scalable in terms of width and linear speed and will enable inkjet to excel in these important markets. Our CEO, Guy Newcombe, will be giving a presentation on the ejection of high-performance materials, using our new print engine, Powerdrop. Details of Guy’s presentation will follow on this page.